Is your dog a Dynamo Dog? How about some treats for your dog that are not only tasty and healthy, but they are functional too? Cloud Star has Dynamo Dog treats that are beneficial for your dog's health. There are two available that are Hip and Joint - Bacon and Cheese or Chicken. Next is Tummy that is Pumpkin and Ginger. Last of all is the Skin and Coat which is Salmon flavored. Each of these treats are grain free. Cloud Star has many other treats available on the website, along with grooming items, cat treats and a few other products. I am interested in their Chewy Tricky Trainers! 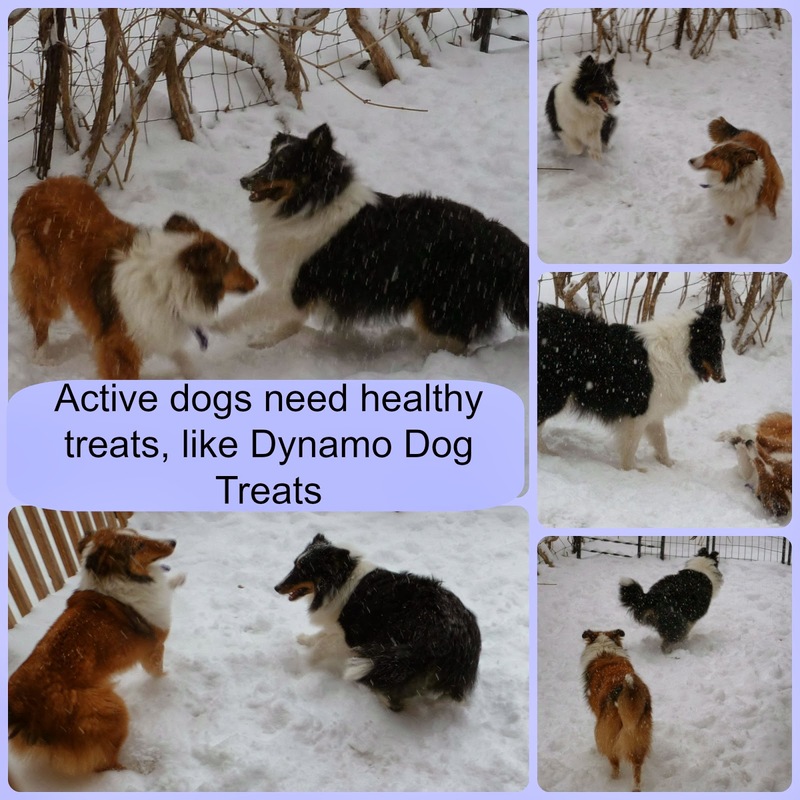 The Dynamo Dog Hip and Joint treats have glucosamine and chondroitin along with beneficial fruits and vegetables to help your dog stay active. Even as humans require vitamins and minerals to stay active, so do our pets. The Dynamo Dog Skin and Coat is probably my favorite, because with Shelties we are always trying to keep their coats in good condition. This treat specifically has Salmon Oil and a vitamin E supplement along with the proper fruits and vegetables to help keep your furry friend's skin and coat in great shape. We have one Sheltie that has sensitive skin, so we are saving most of these for her, but she doesn't mind sharing. The Dynamo Dog Tummy is perfect to support your dog's digestive health. Cloud Star has added probiotics, ginger, and fiber from pumpkin, and yes the proper fruits and vegetables. Now, I will say here, ginger is good for a person with tummy problems, so I can understand why it would be good for your dog's digestion. So by giving your dog the Dynamo Dog treats you are not only giving them a special treat, you are also helping them stay healthy. Want to try some of the Dynamo Dog Treats? Check out their "Where to buy" page. I have a feeling your dog will love these treats. 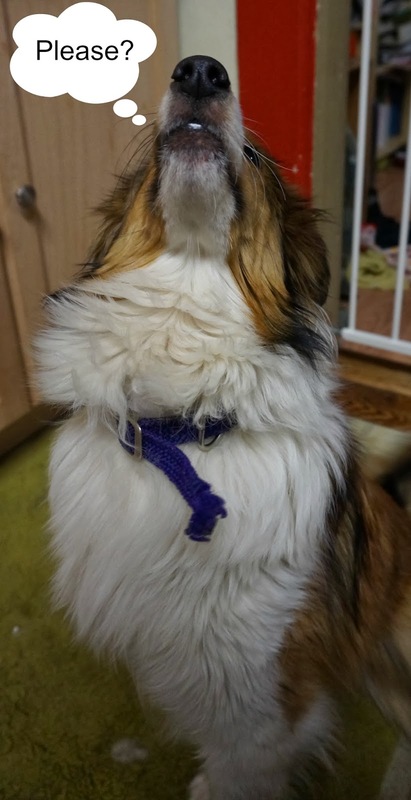 You can see in the picture below, I have someone just waiting for her next treat! Neighbors, I hope you all are enjoying the Petacular event as much as we are. The dogs are LOVING it too! Now be sure to enter the giveaway because Cloud Star has been kind enough to offer 2 winners 2 bags of the Dynamo Dog Functional Treats. The winner will be allowed to choose which two they would like from the 4 treats we reviewed. My girl Gumbo would love to try the Bacon Hip & Joint treats! I like that their products are made in the USA. I'd love to try their cat treats for my three kitties. I think my pups would like the Wag More Bark Less Oven Baked Dog Treats. The oven baked buddy bisquits for my pooch. He would benefit from all the treats that you feature. I'd love to try the Dynamo Dog Tummy treats - we're always looking for special treats to keep spoiling her! My bElla would love to try the soft and chewy buddy biscuits. I know that my dogs would love the Oven Baked Buddy Biscuits. I like the cat treats also that are grain free sometimes it is really hard to find treats for cats that are good. So if I place and order the cats will not get mad when the dogs get their package of treats. I know our Ozzy would love the Wag More Bark Less Oven Baked Dog Treats! I would like the grain free buddy biscuit cat treats for my fur babies. I like the Lavender Buddy Rinse. I have three huge dogs that gets lots of baths. I am interested in Chewy Tricky Trainers. That the products are made in the USA. I really like their wag more bark less items....the treats and the stickers and magnets....pretty cool. I am interested in the Rosemary buddy wash for my dogs. I'd like to try the Buddy wash! I am interested in the Grain Free Soft & Chewy Buddy Biscuits in Homestyle Peanut Butter. I think my dog would like the Chewy Tricky Trainers. I would like my dog to try the Grain Free Soft & Chewy Buddy Biscuits.